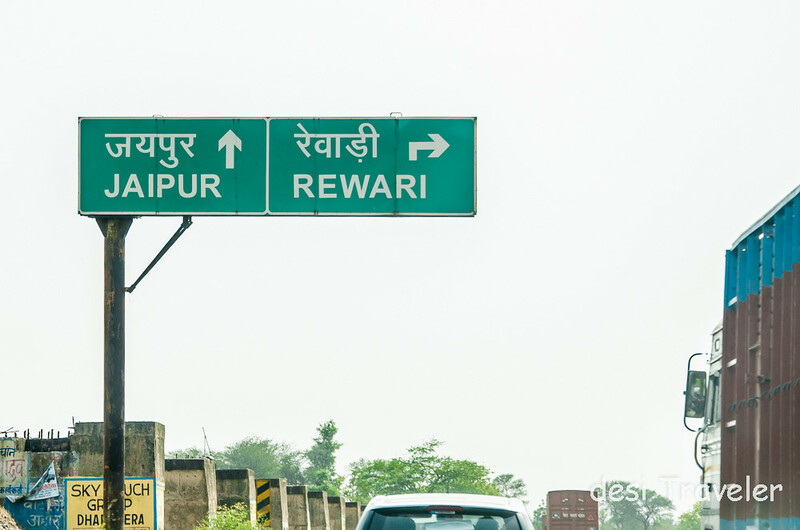 Can there be anything better than a road trip to Rajasthan ? 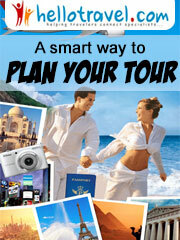 Well how about a road trip with fellow bloggers? But wait let us make it even better. 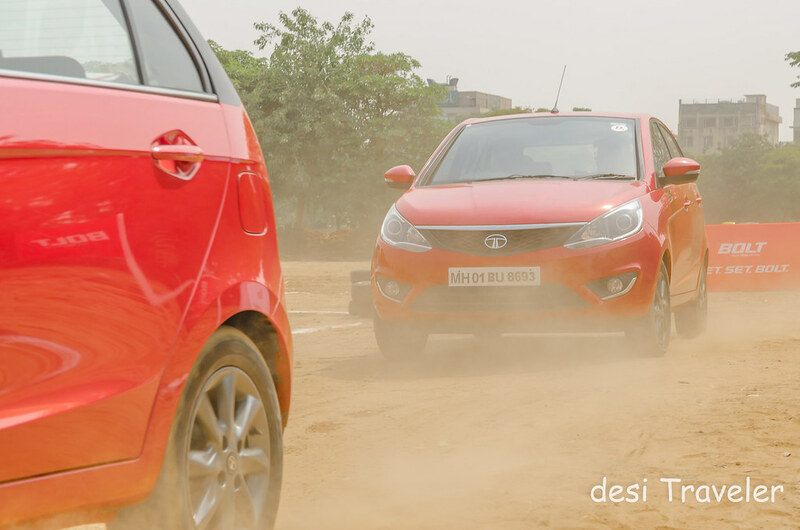 How about a road trip in brand new Tata Bolt, with tank full, and fellow bloggers to give you company and share stories, sing songs and pull each other’s legs? Bus Bus Pajee control nahi ho raha ab to… (बस बस पाजी कंट्रोल नहीं हो रहा अब तो ), I can imagine what you must be thinking. 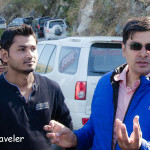 So same was my condition when I got a call from Blogadda if I can join on a Sunday to drive to Fort Neemrana with fellow bloggers. 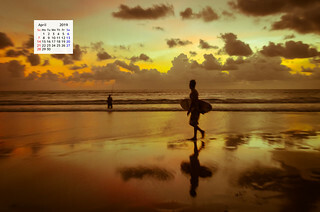 I was like well let me check my schedule. So after eating appropriate amount of Rate, I said yes (थोड़ा भाव खाने के बाद, मैंने हाँ कर दी ). Finally the D-day or the Bolt drive day arrived and I reached the meeting point 5 minutes ahead of time. More than me it was the Blogadda team that was worried about me reaching on time so they were calling me to check if I am coming. I was greeted by an enthusiastic Blogadda team and I met some of the folks I have exchanged emails in past and even spoken a few times. 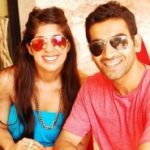 I was so happy to meet jovial Harish Krishnan, the respectable Anuja G (how can you not respect a lady whose last name is G, bolo G?) and fellow bloggers like the Haiku king Arvind Passey and undisputed queen of blogging competitions Manjulika Pramod ( she has won more blogging competitions than yours truly has written blog posts), the super SEO Alok Vats, Tech guru Jaideep Khanduja and the wedding photographer and traveler Priyanka Sachar besides many other whom I was interacting for the first time. The day began with some warm welcome and a presentation about the Tata Bolt by Brand Manager Mr. Inderpreet Singh from Tata Motors. 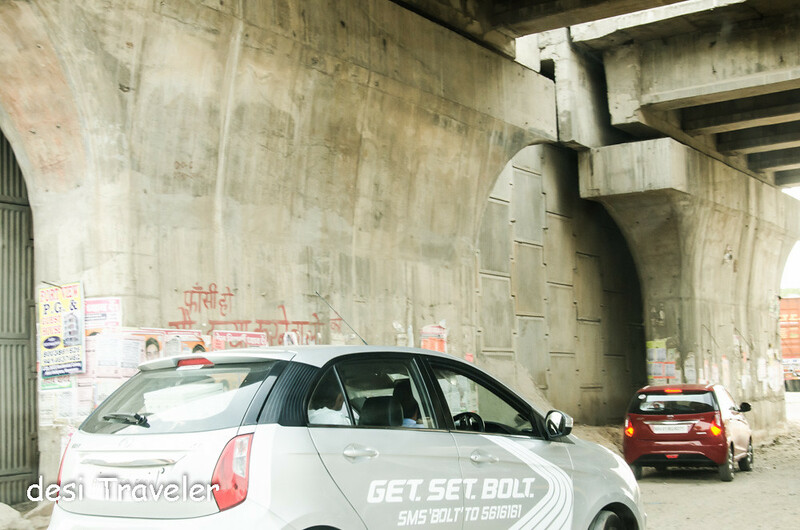 The presentation helped us to understand some of the features of the Bolt and we were itching to drive the brand new cars on NH8 for our road trip to Fort Neemrana. When I got back into the car Alok has completed his drawing and I must say either Alok is very good in drawing or the suspension of Tata Bolt is very good or both are true. “The speed limit for the drive is 90 KM per hour, so please do not drive above 90 KM per hour”, hence every time we reached 90 one of us will remind other that we need to stay below 90. I think it was a good strategy as this avoided unnecessary competition and over speeding on road. 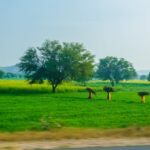 Because desi Traveler believes that the“The Journey is the destination”, so we were enjoying the now open fields on the highway, splattered with ugly factories, apartment complexes and the warehouses. About 4o Km on the highway we stopped for a pit stop at a resort and changed cars. Now it was my turn to be in driver’s seat. 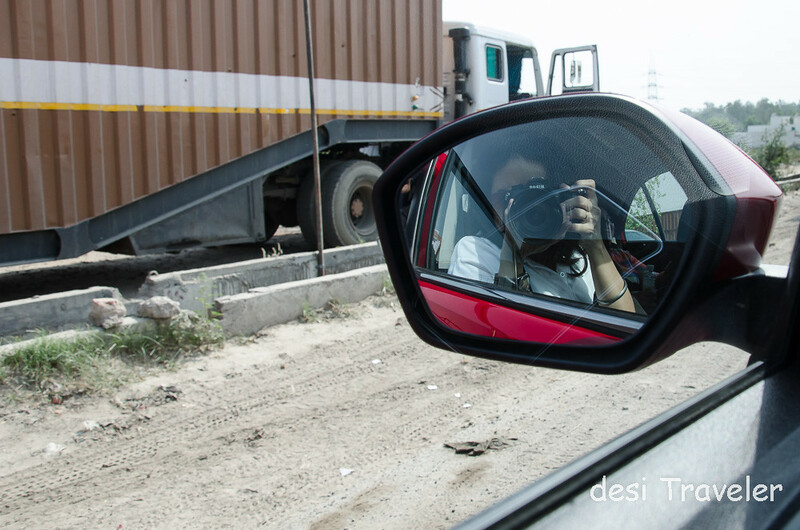 As I got into the driver’s seat Anuja G got into the Photographers role and most of the pictures you see from now on are the handiwork of Anuja. I got into a brand new Diesel Bolt with a big smile on my face. 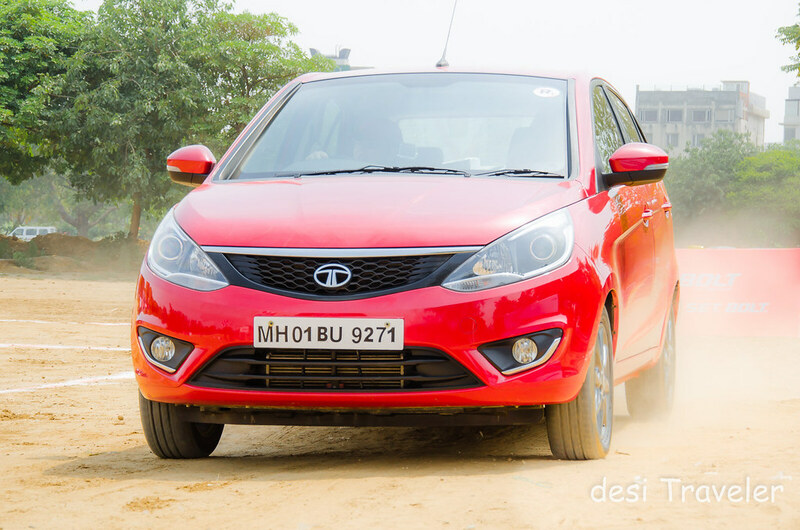 But once we hit the highway again I was a bit puzzled because this Bolt which the Tata guy claimed was a diesel had none of the sluggishness associated with a Diesel car. The steering was so responsive that I was happy zipping around, trying to overtake oversize trucks only to be reminded by a chorus 90 KM, 90 KM, Prasad you cannot drive above 90, and I will slow down back to 89.999 KM per hour. 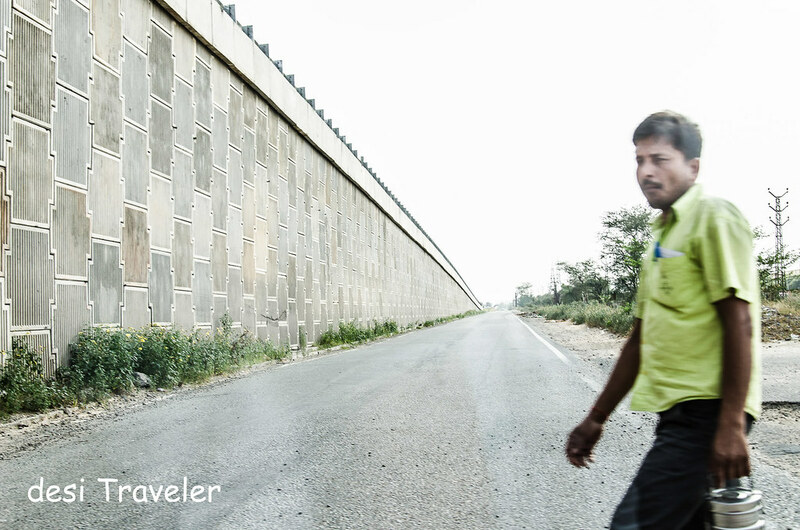 But this was enough to overtake the emperor of Indian Highways the extra long, and fueled by extra strong desi daroo Truck Trailers. In between we got calls from Captain Bolt who was an anonymous voice that we only heard on the tab that was synced by blue tooth with the customized 8 speaker, fully Dhinchak audio system of the Bolt. I don’t know much about these high-end audio systems but what I understood was that you could sync your tab / phone via blue tooth with the audio system that is controlled by a touch screen. 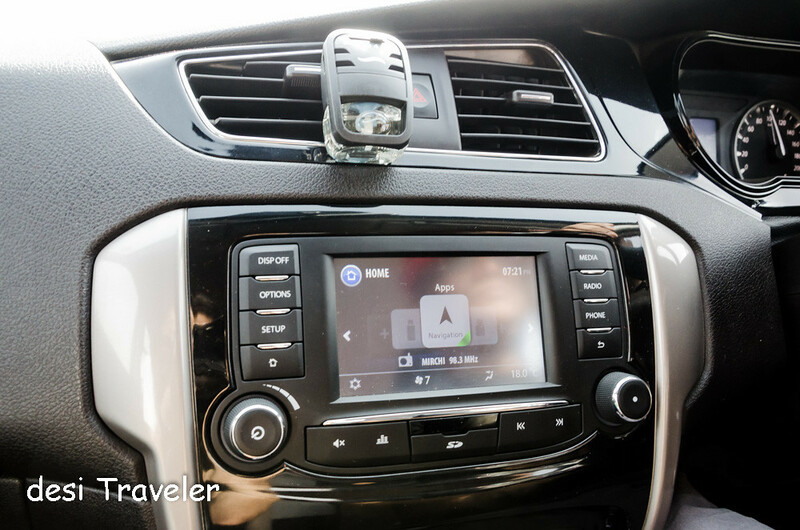 Each of the 8 speakers can be controlled individually and you can sync your destination map and the Bolt will take you there with help of map. Got it? 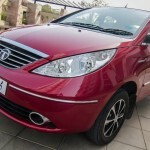 If you want more information then please visit a Tata Motor showroom your city and take a test drive. 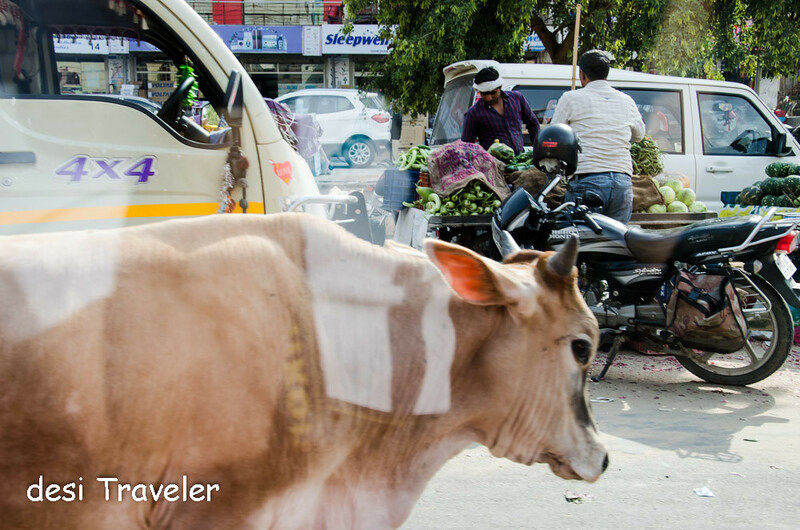 “Namaste GUY Mata”, but mata jee was busy to go to parlor as she had to get ready to attend Kitty party so she totally ignored my Namaste and the divine bovine continued on all her fours, as we slowly crawled around her. !! ). 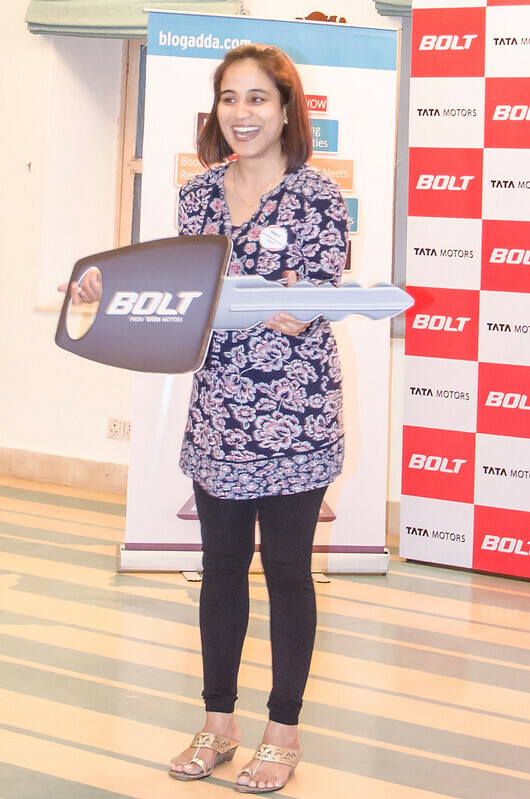 I know you still can’t believe that somebody won a Tata Bolt in a blogging competition, nothing to worry here is a proof: Ragini Puri with her car keys, and the expression that she can’t believe it herself. On the return journey Tata Motors and Blogadda had arranged for drivers to bring us back, but our team decided to drive back on our own and Priyanka and yours truly drove all the way back. In the last leg I was driving the car and in fun I forgot to take the exit to the hotel and continued another few KM on the highway before all of us realized that we have crossed the destination. But none of us was unhappy about it and jovially we took the U turn and headed back to the hotel. 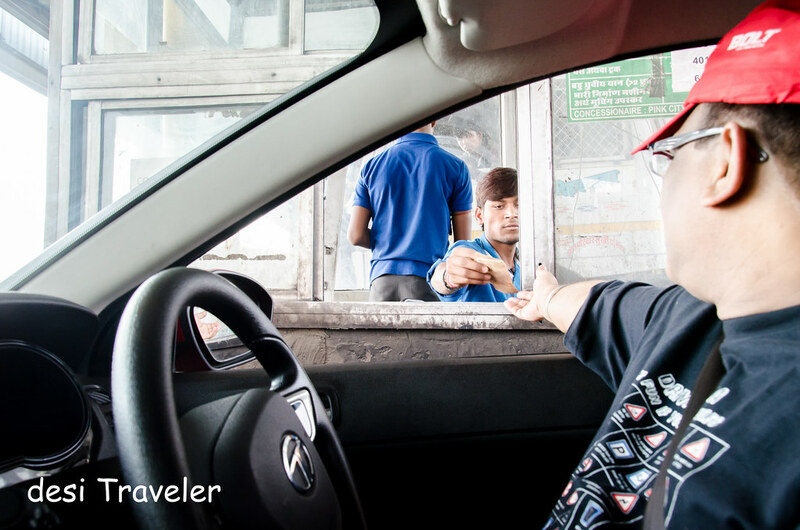 I cannot tell you how hard it was to give back the keys to Inderpreet Singh. But as you know where there is a will there is a way. After I checked the pictures I was not very happy with the pictures I had clicked so I emailed Blogadda folks if I can get the Bolt for some hours just to click some pictures? And after a few emails back and forth later I got a call from Inderpreet and then from the Mumbai headquarters of Tata Motors that they are sending a Bolt for me to click!!! Jai Ho, … this is called desi Jugaad. 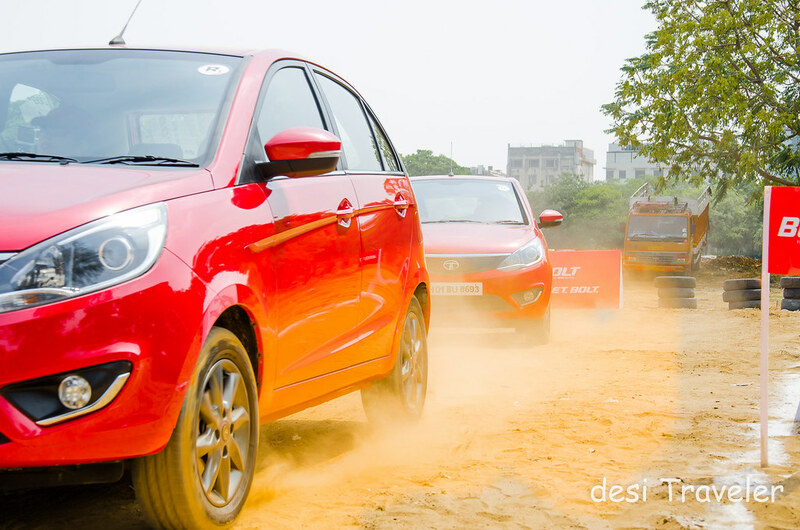 Dear readers next post coming on desi Traveler is of those pictures that your friendly neighborhood desi traveler clicked on the exclusive drive of Tata Bolt. 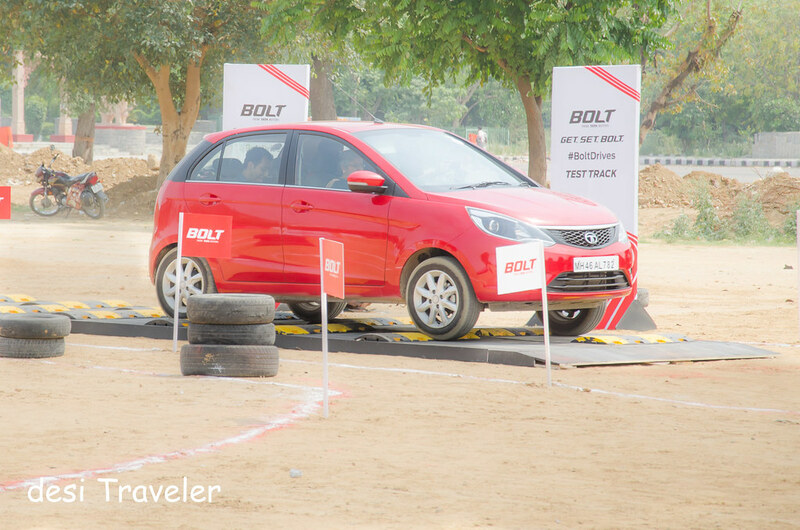 Over all I would say “A Sunday well spent at #BoltDrives with BOLT from TATA Motors in association with BlogAdda.” , and if I have to sum up the #BoltDrives experience this is what I would say “ Tata Bolt- Is car main current hai yaar ”. 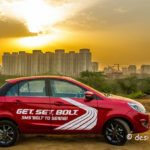 As I mentioned I had the bolt with me for another day so wait for the next post with more pictures of the Tata Bolt. Ha ha..!! This seems to be an absolutely fun event!! 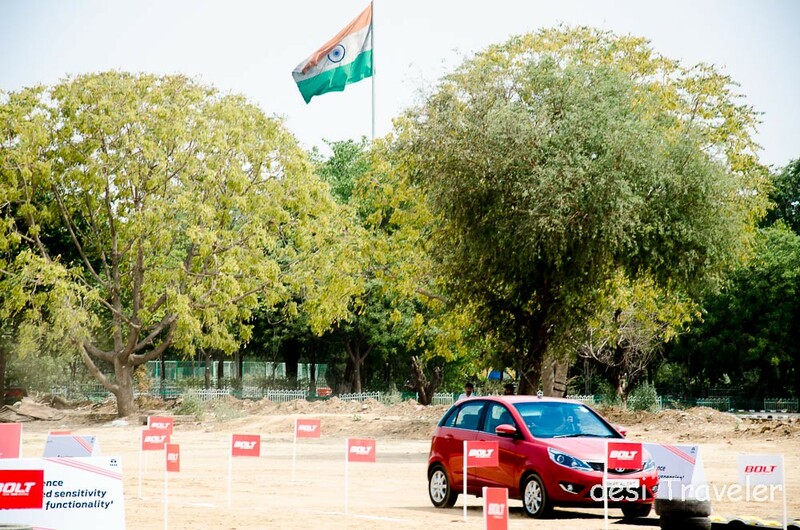 Oh so some lovely pictures of BOLT are yet to come, but the ones above tell a lovely story of our #Boltdrives. Indeed great fun day.